Wind may be the great and so-far strongly underestimated factor when it comes to melting of large masses of glacier ice in Antarctica. Changing wind patterns are now receiving more attention from scientists. Researchers have so far mostly focusses on oceanic currents. Warm water masses are melting ice shelves and glaciers from the bottom. This leads to enormous quantities of glacier ice being lost – for the Totten Glacier in eastern Antarctica alone, the loss is estimated at an incredible 63-80 billion tons of ice. Per year! Totten Glacier is the largest one, but it is not alone. The scenario gains even more horror because of the subglacial topography on a continental scale. The surface of the bedrock under the ice is sloping downwards as you get away from the coast and into the continent, not upwards as with all other continents. This is due to the heavy ice load. This means that warmer sea water, as soon as it has overcome the ice-bedrock-boundary on the edge between the (floating) ice shelf and the glacier (resting on the ground), may penetrate much more easily as it is actually moving downhill, and that’s what water likes to do. The process may accordingly accelerate significantly as it is progressing. Now, wind is coming in as an additional factor, making the whole system much more complicated. But the result is most likely to be yet another increase of ice loss due to basal melting. Normally, there is a rather thin layer of meltwater on top of the water column of the Southern Ocean near the antarctic coast. This meltwater layer is quite thin, but due to its low salinity it has a sharp boundary to underlying warmer waters and it tends to be quite stable. It provides a thermal buffer between the cold atmosphere or glacier ice/shelf ice masses on top and warmer waters underneath. Strong winds can, however, disturb this relatively thin, cold layer of meltwater, making the way free for more temperate water masses from greater depth to come to the surface, where they have a warming effect on ice and air. Strong winds are expected to increase in frequency and force in decades to come in the west wind zone in the Southern Ocean. This implies more frequent weather situations that may help warmer water masses to come to the surface, where they can melt the overlying glacier ice including ice shelves. 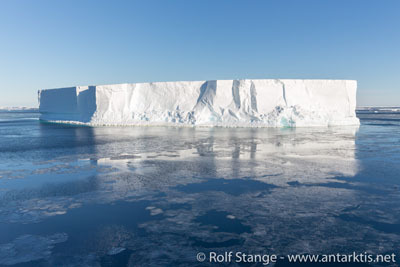 Tabular iceberg in the Ross Sea, Antarctica: symbol of disintegrating ice shelves.